Kevin, "The memory field of this planet is a net implosion field, ... there is no gravity to shield"
What is the difference between the "implosion field" and the 'gravity field' of the planet? They take up the same space. 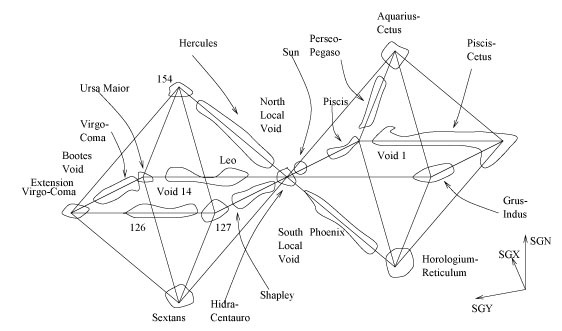 seasmith wrote: Kevin, "The memory field of this planet is a net implosion field, ... there is no gravity to shield"
The net field is the difference between implosion and outrush. These circulate and spiral in/out at the poles and equator. The net result is aprox ninety degrees to surface. The harvest moons net field was interfering hugely last night , and is our best clue giver, imho. Unless We stop using the mythical term gravity, We will always be pulled by this non existant word. The net field creates matter/mass whilst it is an overall implosion field, but that is merely 3D in the universal matrix, the instant communications is not in 3D and TT Browns recorders showed this as they reacted instantly all around the globe, buried deep underground. I would suspect that this is held in the highest security possible. You are absolutely correct that there is no gravitational shadow! What I am directing your thinking towards is that there is no light shadow either! Only a lack of detection, just as the scale set beneath the table does not detect the presence of the book on the table above! The book is not being emitted, correct! But my assertion is that the light is not being emitted either. The difference in this case is that you are looking at an object under the influence of the gravitational field, whereas I am discussing the effects of the field itself. The light field, in my view, does not consist of objects bumping into each other across space neither do I hold that gravitational fields consist of gravitons or other objects moving through space; rather it is the motivating force/pressure affecting said objects. I ponder a great deal current physics' musing about the speed of gravity = the speed of light. While I disavow that gravity moves at c, I do hold that both gravitational and light field act instantaneously across the space defined by their local [unified] fields. Furthermore, the centroid of a light field is associated inseparably with the centroid of the gravitational field, as both are manifestations of the universal unified centropic pressure field. It took me years to overcome my entrenched paradigm that light is moving through space. But a few simple and easily reproduced experiments can show you that it is neither a wave [interference/diffraction] nor a projectile [photon]. And elegant unification leads quickly to the realization that the light pressure [vectors] are toward the centroid of the system, just as gravitation. We experience both as action across distance, and we must and can only use objects moving within their fields to detect their otherwise invisible presence. Optical ray diagrams adequately describe light's behavior, and my assertion is that this is because light is rays [centropic pressure], not waves or particles. Reminder from previous post: all light is invisible, and only a resonant detector placed in line with it is able to distinguish it. To electrify this discussion a bit, EU-ers would likely assert that the electric field is fundamental and universal. I would simply enjoin that the electric/magnetic fields, nuclear fields, Casmir fields, light, and gravitation are all manifestations of the one [universal and unified] centropic pressure field. Last edited by webolife on Tue Oct 10, 2017 3:05 pm, edited 1 time in total. Which are remarkable statements since I have repeatedly admitted I can't understand most of what Kevin says. cant buy into action at a distance because it violates reality. energy is always flowing to equilibrium from high (unequal) to low (or equal). The source of the unequal is the random self assembly of electrons. The double layer is just another structure directing the flows of energy. if there is a simpler way to instantly create a potential difference between you and your surroundings, other than making yourself a circuit and allowing for regulation and conservation, I haven't seen it. webolife wrote: I am in complete agreement with Kevin's hexagonal matrix describing the fundamental geometry of space. That was wonderful to read, and I fully accept and realise how strange I must sound. is imho how a net difference of Your pressure is utilised up in creation leading to the net non existent force called gravity occurring. All in creation is within it's own unique such field, and this planets is our overall dominant such with all other fields vectored towards the heart centre of the dominant field all is within. light is not travelling, it occurs within this net implosion field, thus when distant stars are viewed it is an instant detection less the field reaction of this planets influence. We are not viewing anything from millions of years ago, that is what I cannot understand of how such is described by so called scientists, it's nonsense beyond belief. I do appreciate the effort. But all I can say at this time is, I'll bear it in mind as another possibility. You saying light is instantaneous, and Kevin considering light travel nonsense, made me go look up the history of the speed of light again. It is an interesting read. The speed of light is such a reliable constant, that the SI metre has been based upon it since 1983.
comingfrom wrote: The speed of light is such a reliable constant, that the SI metre has been based upon it since 1983. Why is the author of the first document listed in this Google search arguing that "The constant speed of light must be retained in the 21st century physics paradigm." Is it because the so called "speed of light" might actually be a variable Mean? Or is it because of the dependent developments in Fig 1 and relationships in Fig 3? Is there merit in the fact that the author appropriately recognizes that this is indeed a "paradigm"? A single group of atoms existing only in one copy produces orderly events, marvelously tuned in with each other and with the environment according to most subtle laws … we are here obviously faced with events whose regular and lawful unfolding is guided by a ‘mechanism’ entirely different from the ‘probability mechanism’ of physics. The quote itself is an exoreference (looking outside of one’s self). The various systems, subsystems, molecular, atomic, digestive, respitory and beyond that are coordinating into the whole of one’s very own human body, even in sleep, far surpasses the “’probability mechanism of physics’”. With great confidence the “house of cards” is in much trouble and recognized to be so by its very own. This is not “reliable” by any means and they know it. Why does the following exist and what does it mean? Is the above just another one of those “anomalies” requiring the author of the first referenced work to say that “The definition of the speed of light needs refining.”? Where does the “reliable” aspect come into play? Instead, it looks like regularly moving and manipulating the goal post to fit theoretical concepts is the only real "constant" in all of this. Dear Albert. Welcome to the forum!! The so called speed of light is the net rate of implosion over outrush about the outer zone of this planet. light occurs in this zone. This will not apply outside of this zone. Any device they send outside this zone is made of mass of this planet, and will therefore create light about it when meeting alternative field zones ( especially the sun) any measurements taken will not though be anything to do with distances related to this detectable so called speed of light. We are naturally fooled by this by been creations operating within the zone about this planet. The light seen on the moon and all other planets and moons will be relevant to the net rate of implosion over outrush related to each. The implosion and outrush creates the polarity and magnetic effects and so called spin rates, all in an electric universe where electro magnetic and electro gravitic consequences occur. The limit of C will not exist outside of the local zones about all mass. since the speed of light is completely dependant on the density of the medium it is travelling through, the lower the resistance the higher the speed. A form of conductivity but for light. the only way to do this is to move away from large masses, i.e outside the solar systems and even outside the galaxies have different speeds of light than within them. your not seeing through time just distortions caused by local electromagnetic influences. Webbman wrote: since the speed of light is completely dependant on the density of the medium it is travelling through, the lower the resistance the higher the speed. A form of conductivity but for light. Light We see by is but a tiny part of an occurrence , IMHO it is not TRAVELLING, it occurs relative to the meeting of an opposing slightly variant pressure. All so called electromagnetic waves are local variations created within these opposing geometries, when We create a radio so called beam , it is a local variation that can be attuned to. Due to a total non comprehension of universe We attribute occurrences to what We experience about this planet, and anything sent out into universe is still part of this planet, made of the self same geometries of this planet. if that were the case there would be no heat in the universe, just magnetism. also electricity wouldn't need light and plasma to travel the expanses. since there is heat and we do require light and plasma for electricity to move (in addition to magnetism) we can conclude that the aether, which I think you are referring to, is not a perfect conductor and not evenly distributed. all these things are reliant on the alignment and density of the base material which is why when we look into the universe we see great amounts of stranding everywhere we look, from the cosmos to your own body. most certainly not a perfectly packed solid. Webbman wrote: if that were the case there would be no heat in the universe, just magnetism. 1. First of all, heat is also the experience of centropic pressure. As you approach the centroid of a local system heat increases proportionally as the radial vectoral density increases. Movement or orientation toward the centroid increases both heat and light [as gravitation also] while movement or orientation toward the opposite direction is cold, dark, and less "gravitational". 2. While the universe is geometrically packed [Kevin sees this as "solid", I see it as a geometric matrix], it need not be a solid material aether... "superconductivity" is available in a vacuum, ie. zero resistance... At the lowest field hierarchy imaginable, this vacuum of "space" separates individual objects. As an elegant unification, the same principle can be applied to large fields. Furthermore, the hexagon is the natural consequence of universal centropic pressure, built upon the fundament of the equilateral triangle or trisogon. The constants of physics are ideally derivable from geometric relationships found within this geometry. All other shapes are derivatives of this basic construct. 3. You [Webbman] are still thinking in terms of energy moving across space as photons or waves, thus instantaneity feels to you as if it meant "infinite speed", an oxymoron and contradiction to reality, as you said. If the field is viewed rather as a unit [unity], then the experience of the field periphery and the field centroid are simultaneous. An "implosion event" [as Kevin likes to term] at the centroid is sensed immediately by the peripheral observer in that same field. Extend this unity to the universe [possible only if you can visualize the material universe as finite, as I do], and you begin to understand why what we experience in "reality" as gravitation, light, charge, magnetism, nuclear force, etc. are instantaneous actions across a distance, however small or large. 4. The paradoxes of relativity, heisenbergian uncertainty, and "duality" are utterly resolved if the true "constant" of lightspeed is understood to be "zero". The basic dynamics of the universal matrix are consistent with a finite, unified, centropic pressure field. All I deduce is relative to that which I detect. My hardest ( pun intended) part to come to terms with was how the lattice matrix I detect NEVER moves. The pressure of the aether is thus controllable. Time then comes into play, as all is memory , displace in location of memory to so call move in time. We instantly communicate with our universal selves, good job We are down in the mad ideas section?